More than 320 million metric tons of plastic are produced every year. Most of it ends up in ocean in places like the Great Pacific Garbage Patch. The Great Pacific Garbage Patch, also known as the Pacific trash vortex, is three times the size of continental France and situated between Hawaii and California. According to estimates, 1.8 trillion pieces of plastic, weighing 80.000 metric tons, equivalent of 500 Jumbo Jets is accumulated in this area. Ocean Cleanup, a non-profit organization based in Delft, Netherlands has deploying a huge Pacman-like sweeper designed to collect floating plastic in the Garbage Patch. 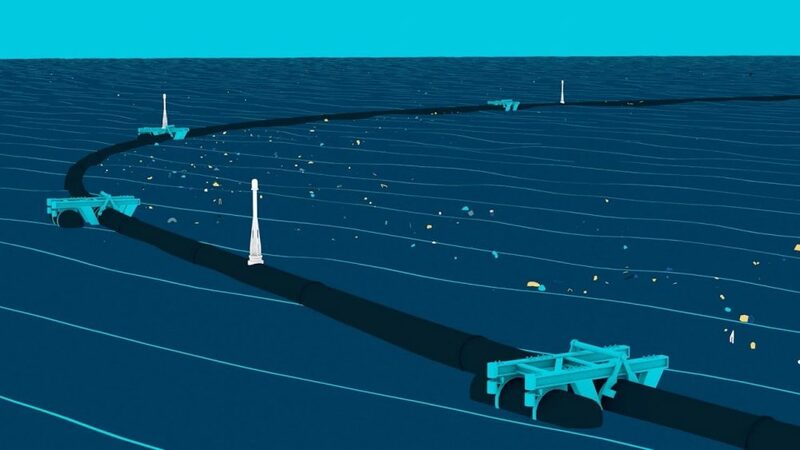 The Ocean Cleanup project is the brainchild of 23-year-old Dutch inventor Boyan Slat. Called System 001 boom, this radical system consists of a 600-metre-long floating tube that sits at the surface of the water with a tapered 3-metre-deep skirt attached below. Curved into ‘Pac Man’ shape, this tube will drift naturally with the currents and the winds to trap the plastic debris. The trapped debris will be removed from the ocean by a vessel every few months and taken to land to be recycled. Slat hopes to build around 60 of these booms to cover the Pacific Ocean. If all goes according to the plan, the £20m ocean-cleaning device could effectively solve one of the world’s biggest environmental hazards to make the seas safer for marine wildlife.